Are there people in your life whose vote for Trump surprised you? Do you have to maintain relationships with loved ones whose support of Trump makes conversation difficult? Arguing and fact-focused debunking can make people less likely to change their minds about supporting Trump. Alternatively, we encourage taking the time to actively listen, connect, and talk with Trump supporters you know as a way to attempt to change hearts and minds. Too many people are getting into fact-focused arguments that wind up making Trump supporters more likely to dig their heels in and get oppositional. Instead, we propose using these suggestions to have value-focused conversations. The idea is to take time to listen to and talk with Trump supporters you know. Over time, listen to understand how Trump’s platform resonates with them. Identify key motivating values. Then, during your conversations, indicate how you connect with these values and show them how Trump doesn’t actually represent those values. If possible, use your time and energy wisely: the most vocal and passionate Trump supporters are not going to change their minds. Focus on those who are on the fence and those whose vote for Trump took you by surprise. Belief and political opinion take time, connection, and care to influence. Focus on listening to and connecting deeply with a small number of people so you can understand how they got where they are and how they could be swayed. Choose calm times to have these conversations. Already tense situations lead to quick reactions as well as being defensive and closed off. Allow your listening to be a roadmap for how you approach changing their minds about supporting Trump. In many cases, values are more important in these conversations than facts. Taking the time to hear an individual’s feelings, opinions, and values will help you have a productive dialogue. Listen to their feelings and respond respectfully with your own. Frame your conversations around the values and things they care about. Rather than using the topics and themes that are most important to you or that you are most passionate about, let the topics they are passionate about or are concerned about take the lead instead. Let’s act now and act deliberatively to talk Trump out of the hears and minds of our neighbors and loved ones. There are many tactics we can and will use to resist, build, and create change. Let’s make something as simple as talking a powerful tool. 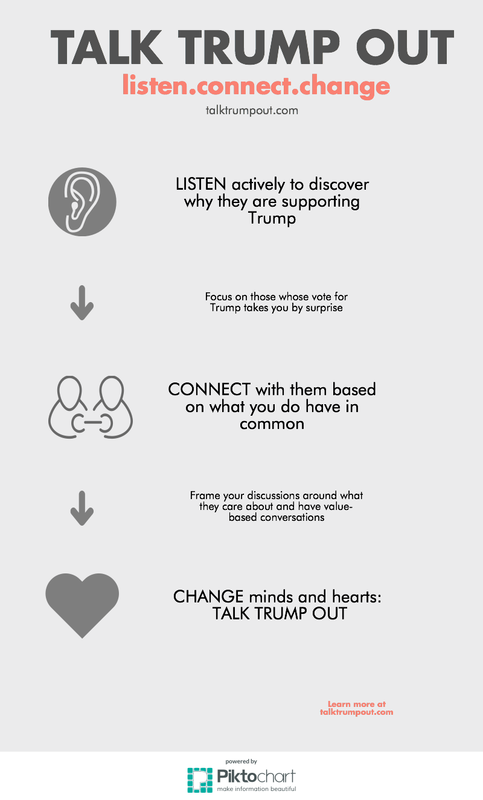 Talk Trump Out is a tactic that encourages listening, connecting, and talking with Trump supporters with the goal of changing their hearts and minds. Please send or share your experiences and suggestions on how best to listen, connect, and talk with people who support Trump.